This page is a walkthrough of how to build an app that uses the rear facing camera to show a view of the detected faces in front of you. The screenshot below shows it in action; this was taken on a tablet that was pointed at a monitor displaying a photo. We'll show you how to track several faces simultaneously and draw a rectangle around each, indicating the approximate position, size, and face ID of each face. If you want to follow along with the code, or just want to build and try out the app, it's available in the FaceTracker folder of our Github samples. Once started, the rear facing camera will continuously send preview images into the pipeline. The CameraSource component manages receiving these images and passing the images into the Detector, at a maximum rate of 30 frames/second as specified above. Note: when camera frames arrive at a rate faster than the detector can handle, the camera source will drop frames in order to keep up. mode = fast: This indicates that the face detector can use optimizations that favor speed over accuracy. For example, it may skip faces that aren’t facing the camera. landmarks = none: No facial landmarks are required for this demo. Keeping this off makes face tracking faster. 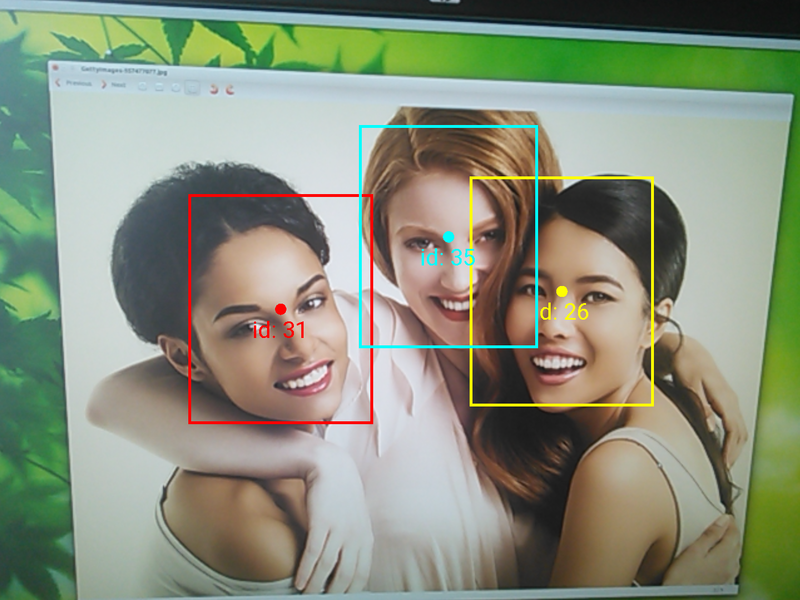 prominent face only = false: This demo can track multiple faces. If only a single face is required, setting this option would make face tracking faster. classifications = none: Smile and eyes open classification are not required for this demo. Keeping this off makes face tracking faster. If you see an overlay that is flickering and changing color, this indicates a detection that is near the limits of what can be detected given these settings. The face becomes obstructed and/or disappears and re-enters the view. Tracking works on a continuous basis, so any period of time in which the detector is not seeing the face will reset the tracking information. 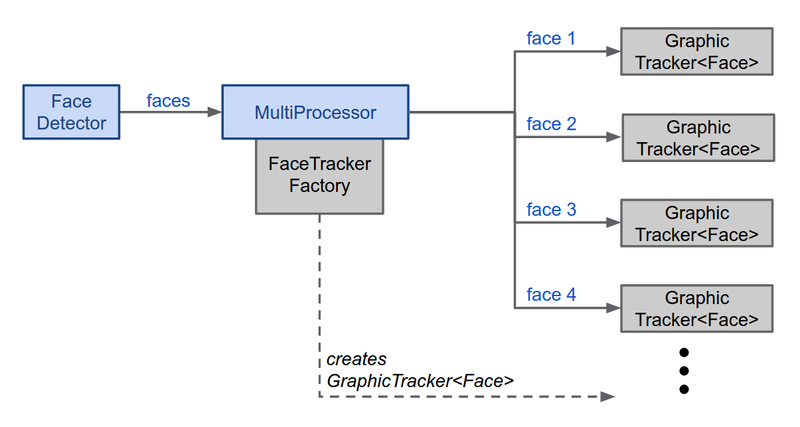 As new faces are encountered, the multiprocessor will use this factory to create a new GraphicFaceTracker instance for each face. As those faces move over time, updates are routed to each of the appropriate face tracker instances. When a face is no longer visible, the multiprocessor will dispose of its associated face tracker instance. In this way, we dynamically create/track/destroy an individual face tracker for each face that we encounter in the app. Each GraphicFaceTracker instance maintains an associated FaceGraphic instance, which is a graphics object that is added as part of the overlay of the camera video. This instance is created initially when the face is first encountered, updated as the face changes, hidden when the face is temporarily missing, and is removed when the face is no longer visible.